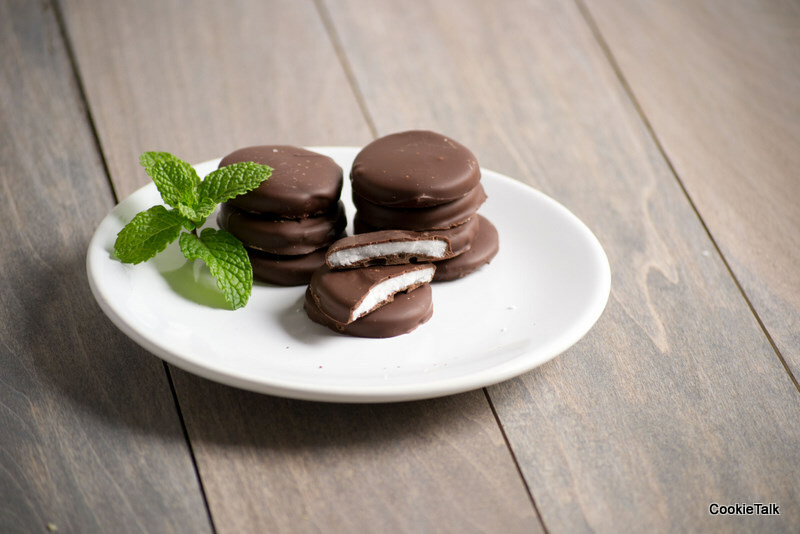 Peppermint patties. People either love them or are indifferent to them. I’m in the latter category but my dear hubby has always loved them. He said he used to get them in his stocking at Christmas time. Mint has never been my favorite treat. I’m not one of those girls who’s favorite ice cream is “Mint Chocolate Chip” (it’s coffee, in case you were wondering) and Thin Mints from Girl Scouts were by far my least favorite (I’ll take a box of Tagalongs, please). All that changes when something is fresh and homemade. I loved these peppermint patties. My husband loved them. My mom devoured them. And, they were easier to make than I expected. I thought I’d be pulling my hair out, but they weren’t hard at all to make. Time consuming, but not hard. And so worth it. Hubby did most of the chocolate dipping. He did a great job, don’t you think? It’s good to have a partner in crime in the kitchen! This is my second batch. The first batch tasted great, but turned out less than photogenic. The second time around I froze the patties for several hours. It is much easier to dip if they are ice cold. 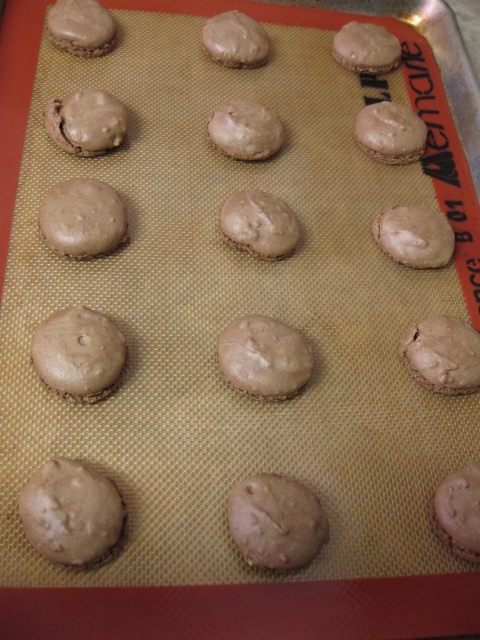 I also added cocoa butter to make the chocolate mixture thinner which made for easier dipping. If you don’t have cocoa butter, you can try a tiny bit of vegetable oil. Or just skip it, but it will be thick and harder to dip. Right now King Arthur Flour has $3 ground shipping so it is a great time to buy those hard to find items like cocoa butter (which will last for years! ), black cocoa, and fiori di Sicilia. And don’t forget the sourdough starter! Merry Christmas to you, right? Prep time: About 1 hour, plus freezing time. 1. Mix together the powdered sugar, corn syrup, water, peppermint extract, and shortening in a mixer. It will take a while to come together and will still only be crumbly. If it is very dry where you are, spritz lightly with a little extra water. 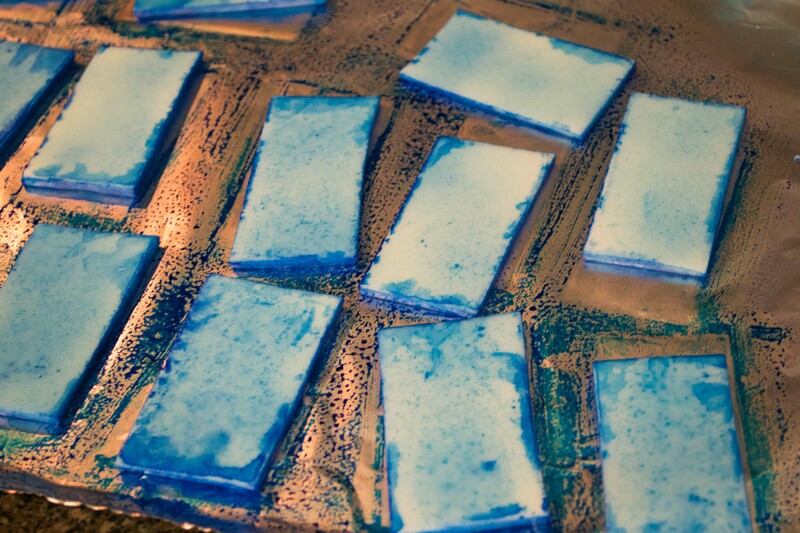 Once you start seeing large pieces come together, it is ready. You should be able to form a ball and hold its shape. 2. Move mixture to workspace and knead lightly until smooth. You may need to spritz lightly with water. The first time I made these it was more humid out and the dough was easier to work with. It is a little more challenging when it is dry outside. Wrap in plastic and freeze for 15 minutes. 3. Roll dough until 1/8″ (or larger if you like thick patties). 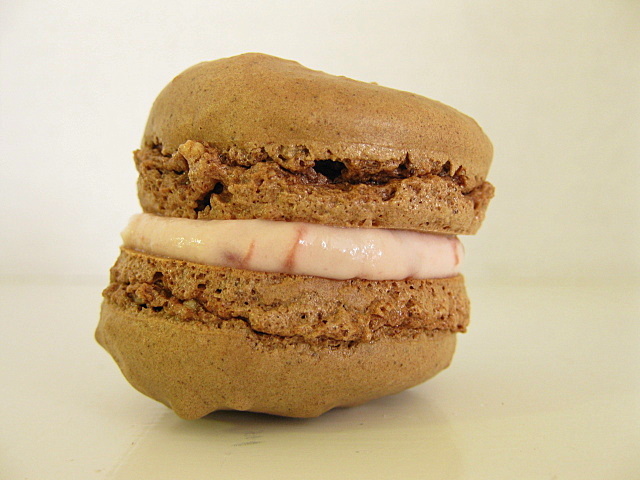 Dust with confectioners sugar as needed but try not to go overboard. It will make your dough dry. 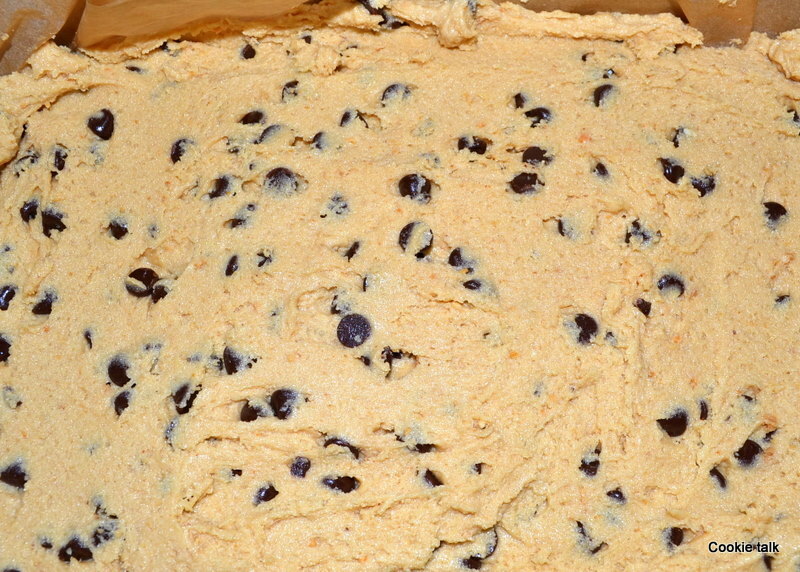 Return to freezer if dough becomes difficult to work with. 4. Cut into circles. I used a 1 1/2″ cookie cutter. You can use whatever you have. Even a shot glass would work. Place patties on a sheet pan. Re-roll scraps and cut again. 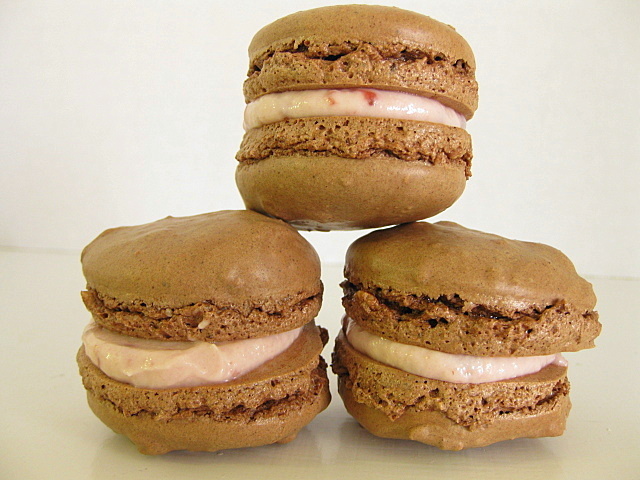 Freeze patties for several hours or overnight. 5. When ready for dipping, prepare a double boiler by placing a heat proof bowl over a pan of simmering (not boiling!) water. Make sure the bowl does not touch the water! 6. Melt 9 ounces, or about 3/4ths, of your chocolate until smooth. Remove from heat and add remaining chocolate. Stir until smooth. Return to heat and add your cocoa butter. Add more if chocolate is too thick. Turn heat off but keep chocolate over the water to keep warm. 7. Using a fork, dip the peppermint patty quickly into the chocolate, covering completely and then shaking excess off. Use a knife to scrape patty off of fork back onto the sheet pan. Repeat until all patties are complete. 8. Leave at room temperature uncovered until completely set. Once set, you can cover them, but they may get spots so you are best just leaving at room temperature, preferably in a candy bowl where everyone can enjoy! 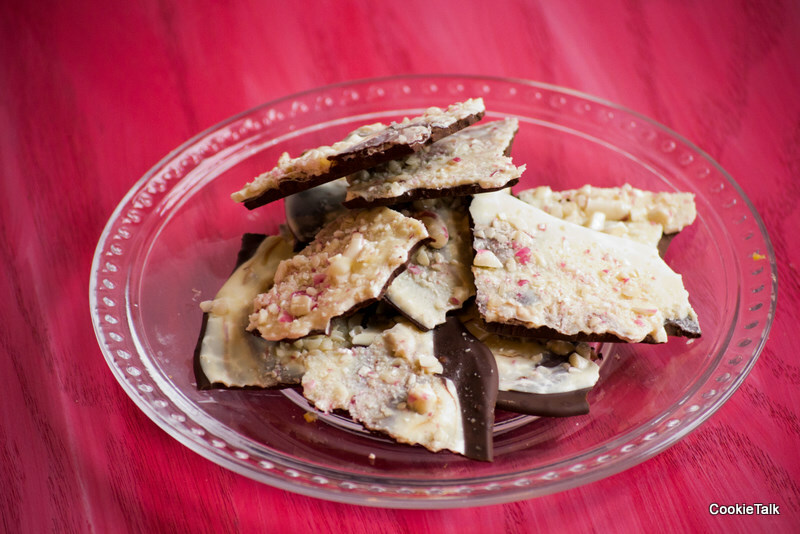 Day 6 of Baker’s Dozen: Candy Cane Bark. 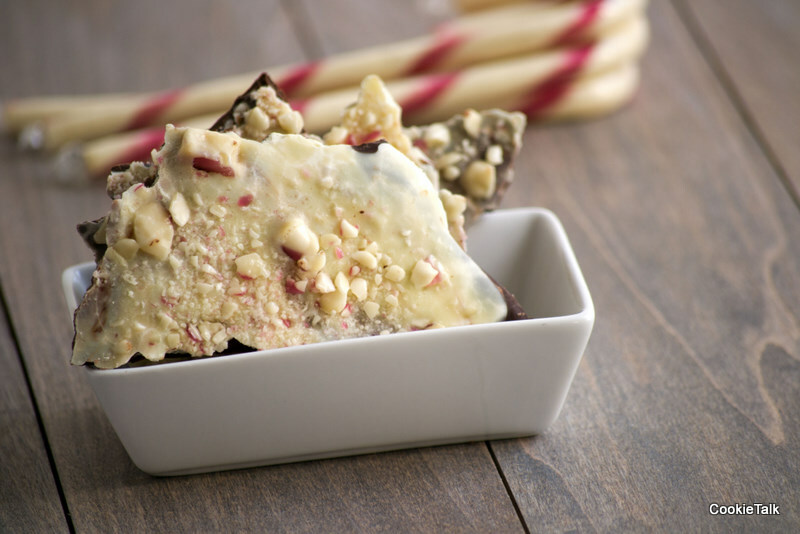 Candy cane bark is everywhere these days, but, amazingly, I just had it for the first time last year. And of course, I love it. I love chocolate and I love candy canes. And this treat just screams “Happy Holidays!” don’t you think? I know I’ve posted a lot of stuff that I’ve said is easy, and I promise all are, but this is one of the easier ones amongst the easy treats. You don’t even really need a recipe. Just melt some chocolate, add peppermint, add crushed candy canes and you are done! See, easy! This makes a pretty small amount, but is easy to double. Adjust the candy cane and peppermint extract to your liking. 1. Chop both chocolates separately. Bring a pan of water to a simmer. Set up a double boiler: set a heat proof bowl over a pan of simmering water. Make sure the bowl does not touch the water. Line a half sheet pan with parchment or silpat and set aside. 2. Melt the semi-sweet or dark chocolate first. Spread onto sheet pan making chocolate as thin or thick as you desire. Set into refrigerator for about 5 minutes to help set. Don’t leave the chocolate in the refrigerator or it will make your chocolate spotty. 3. Meanwhile, melt your white chocolate. Add peppermint extract to white chocolate. Once chocolate is mostly set, spread white chocolate over the chocolate. If it isn’t set yet, you may have swirls, but it looks pretty, I think. 4. Spread candy cane over white chocolate before it sets and gently press candy into chocolate. 5. Let set at room temperature until firm. It was rainy when I made this, so it took awhile to set up. Don’t be surprised if it has to sit overnight. Once set, break into pieces and enjoy! Fudge. And that’s all I need to say about this post. Kidding. Sort of. I love fudge. Really love fudge. But only good fudge. The kind you can get at a really good chocolate store. 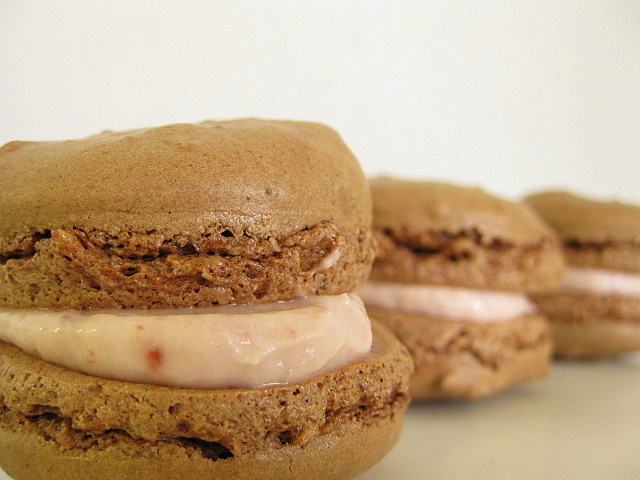 Rich and creamy and melts in your mouth (not to be confused with that *candy* that melts in your mouth, supposedly). And when it comes to fudge, I am a purist. Just chocolate for me please. Sure, I’ll try the others, with nuts, egg nog, pumpkin, cookies. They are all fine. Even made peanut butter for this post since hubby loves peanut butter. But I just want to savor my chocolate fudge. That’s all I need. And this was the first time I had made fudge the way it is supposed to be made. No marshmallow fluff. No condensed milk. I’ve made those versions before. They are quick and easy. But not the real thing. And not nearly as tasty. I did the old fashioned way of cooking the chocolate mixture to 235F and then waiting. And waiting. And waiting for the full 24 hours for the chocolate to completely set so you can then start nibbling. One piece here, just one more there. Oh fudge. My hubby also loves fudge as much as I do, but his love is split between chocolate and peanut butter. The peanut butter fudge turned out good, but not amazing. It was a bit dry (but got better as the days went on) and I think that was because I used fresh ground hippy, dippy, and trippy peanut butter instead of those awful brands Skippy, Jif, and whatever other company dares to call their “product” peanut butter. I’ll spare you the ingredient list this time, but those products have who knows what else added to the peanut butter. The product I used just had peanut butter. It had great peanut butter taste, just was a bit dry. 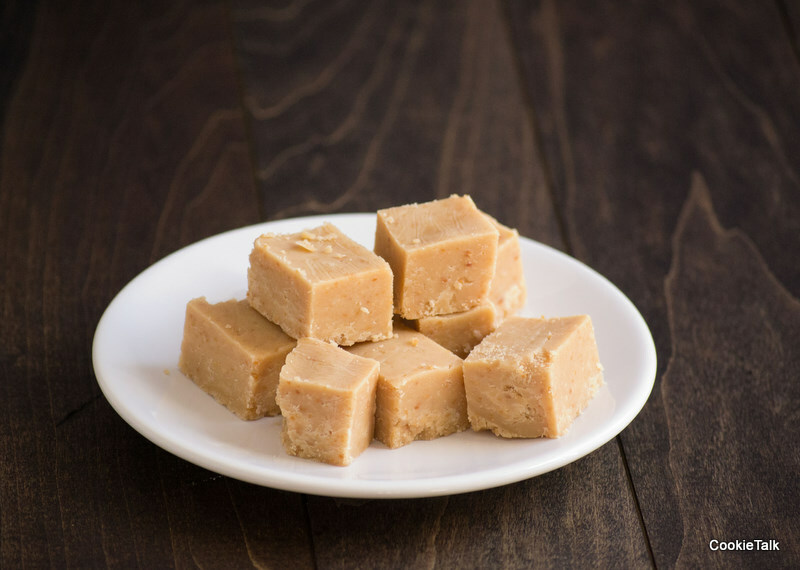 The perk about this peanut butter fudge is that it is really easy to make. I actually made the peanut butter fudge while waiting for the chocolate fudge to cook. Yup, that easy. 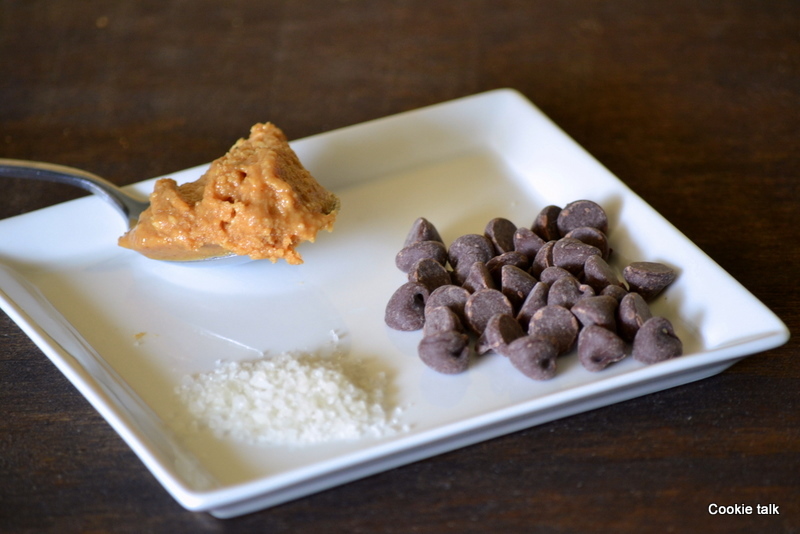 Just melt the butter and peanut butter together, make a mess while adding powdered sugar, and voila! 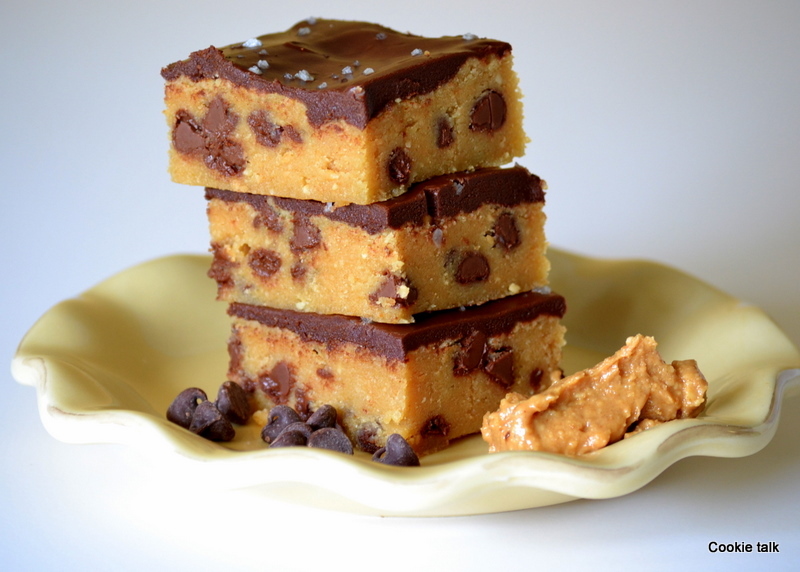 Peanut butter fudge! Meanwhile, you’ll still be waiting for the chocolate fudge to rise to the proper temperature. It will be worth your wait. Might as well clean your kitchen, since if you are like me, you will have powered sugar everywhere. 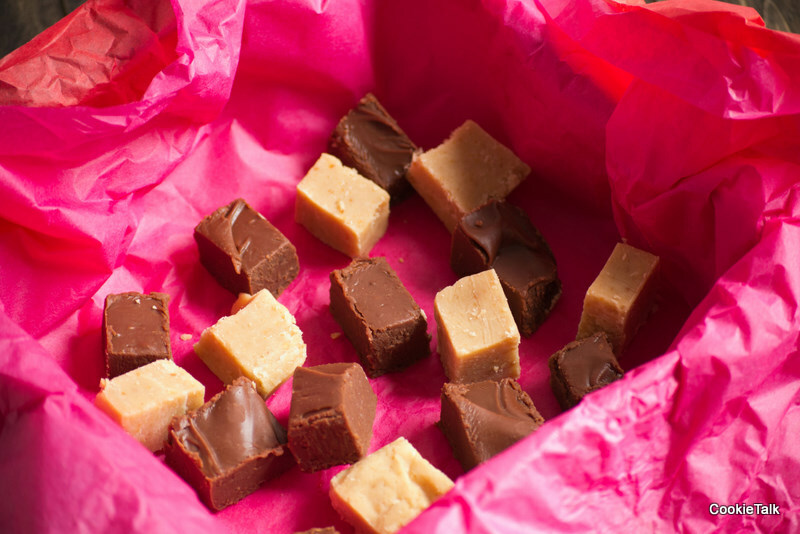 And who doesn’t like to receive fudge as a gift, all wrapped up and pretty? 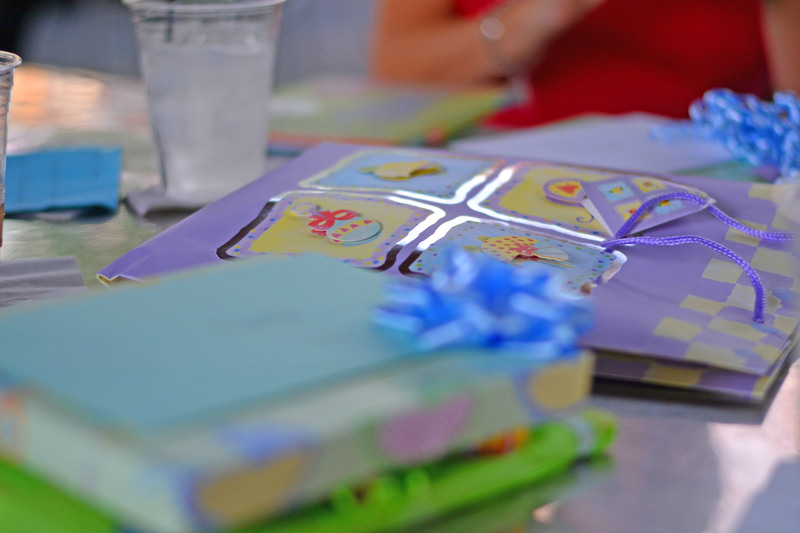 It’s a sweet gift and from the heart. Both recipes came from Brown Eyed Baker, who subsequently got the recipes from Joy of Cooking, which, sadly, I do not own. It’s a classic and I should have it. Maybe for Christmas. 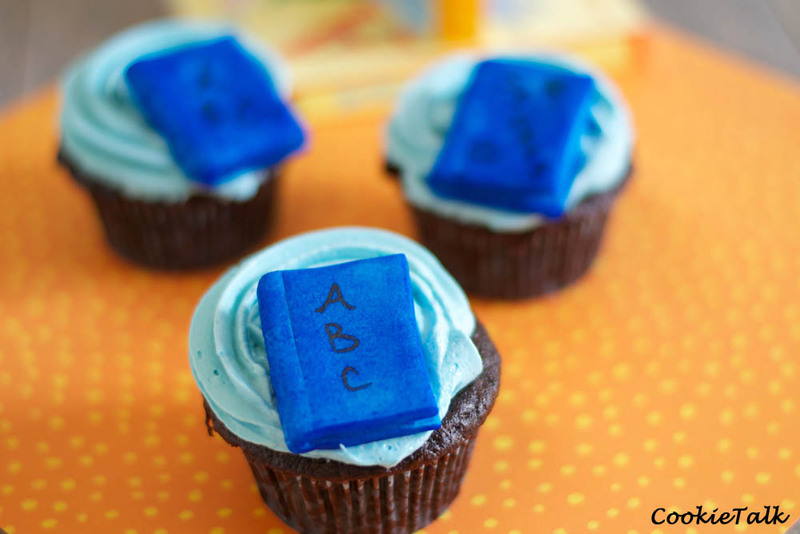 Thanks, Brown Eyed Baker for the fudge inspiration! 1. 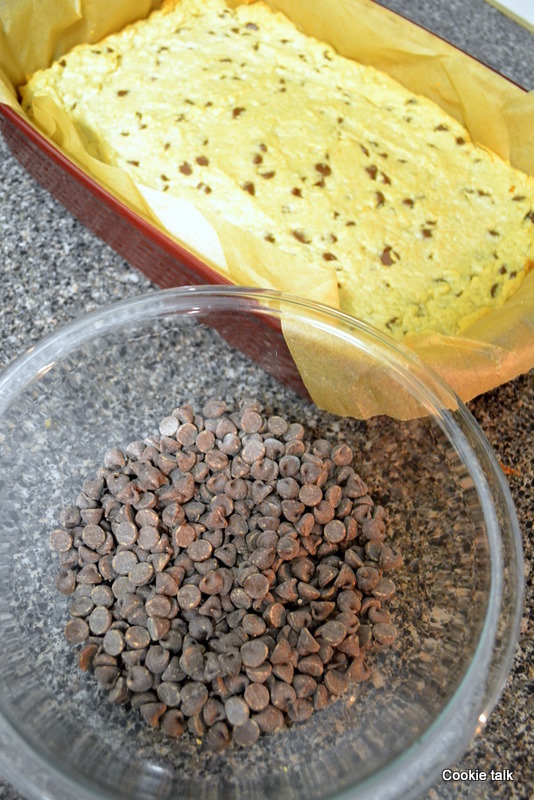 Line an 8-inch square baking pan with foil that extends over the sides. Butter the foil and set aside. 3. Stir in the chocolate until melted and completely smooth. Set the pan over medium heat and place a candy thermometer in the pan. Cook the mixture, without stirring, until it reaches 238 degrees F, the soft-ball stage. Remove from the heat. 4. Add the butter and vanilla but just let float on top – do not stir in (stirring at this point can cause graininess). 5. Cool the candy to 110 degrees F by placing the bottom of the pan in cold water to stop the cooking. This will take awhile, especially since you can’t stir. 6. When it is cool, stir the fudge in the pan with a wooden spoon just until it “snaps” and begins to lose its sheen.You will notice that it will be really shiny, and then almost dull. That’s when you are done. (Alternately, transfer the cooled fudge to the bowl of a heavy duty mixer. Using the paddle attachment, beat the fudge on low speed until it begins to thicken and lose its sheen, 5 to 10 minutes. Watch the mixture carefully or it may thicken too much and become unworkable.) I used my handheld KitchenAid mixer and it worked great…but…it has a very low speed 1. If your handheld does not have a low speed 1 (and many of the “bargain” ones don’t) I would not recommend this. 7. Stir in the walnuts if you are using them. Turn the fudge out into the prepared pan. Smooth the top with an offset spatula, moving quickly and keeping the spatula on the chocolate until you are done spreading. This will minimize the mess. Let stand for at least 1 hour. 8. 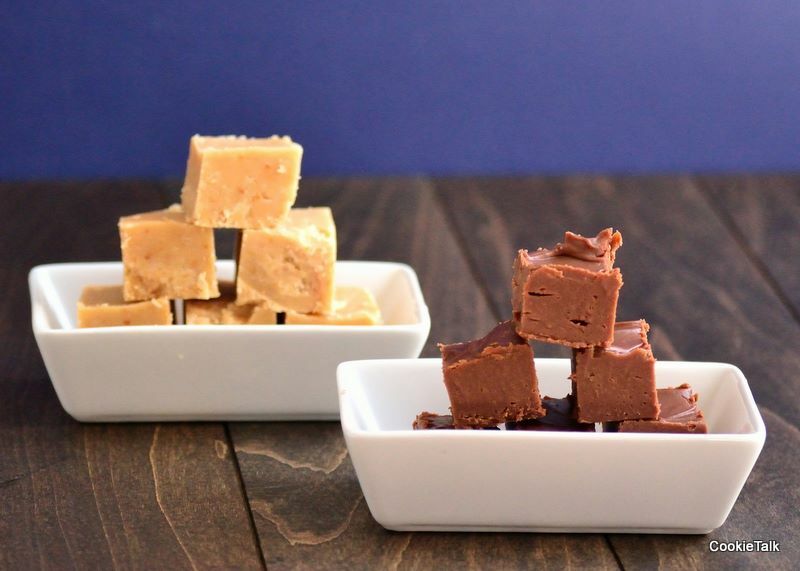 Use a large knife to score the fudge into 1-inch squares (optional – it will still cut nicely when set) Cover and refrigerate at least 24 hours. 9. Remove the fudge from the pan and peel off the foil. 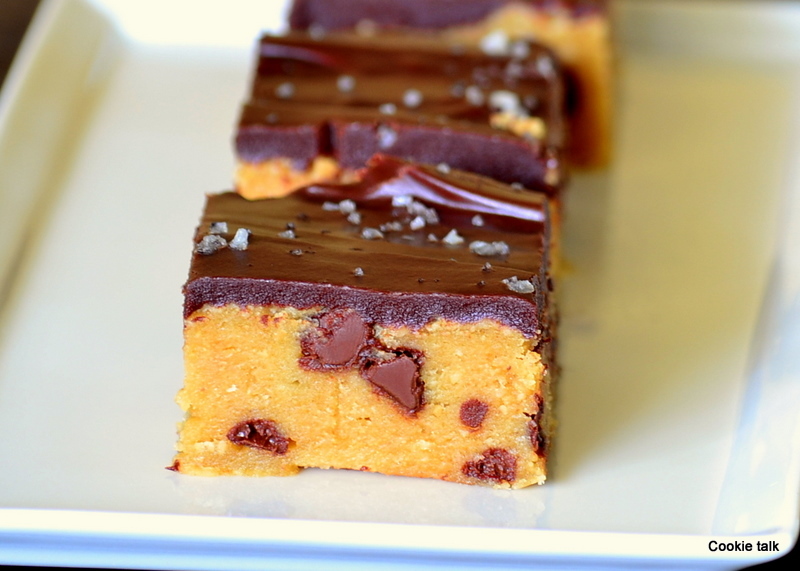 Use the knife to finish cutting the fudge into squares. 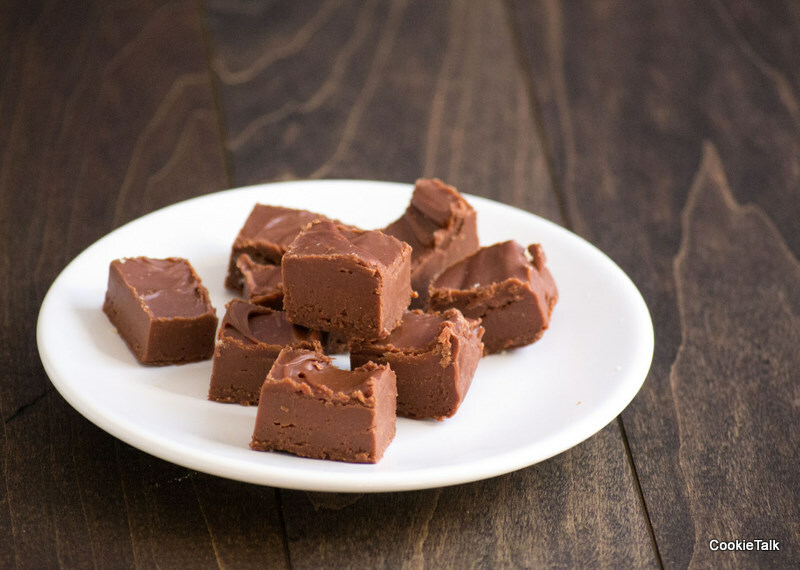 The fudge can be stored in an airtight container in the refrigerator for up to 3 weeks. It can also be stored at room temperature if it won’t last long. And it won’t. Serve at room temperature. 1. Butter an 8-inch non-stick baking dish (or line with buttered parchment paper) and set aside. 3. Add the salt and vanilla extract, then stir in the powdered sugar until smooth and no lumps remain. 4. Pour the fudge mixture into the prepared pan and smooth the top. Press a piece of plastic wrap directly on the fudge and refrigerate until set, at least 1 hour. Cut into squares and serve. 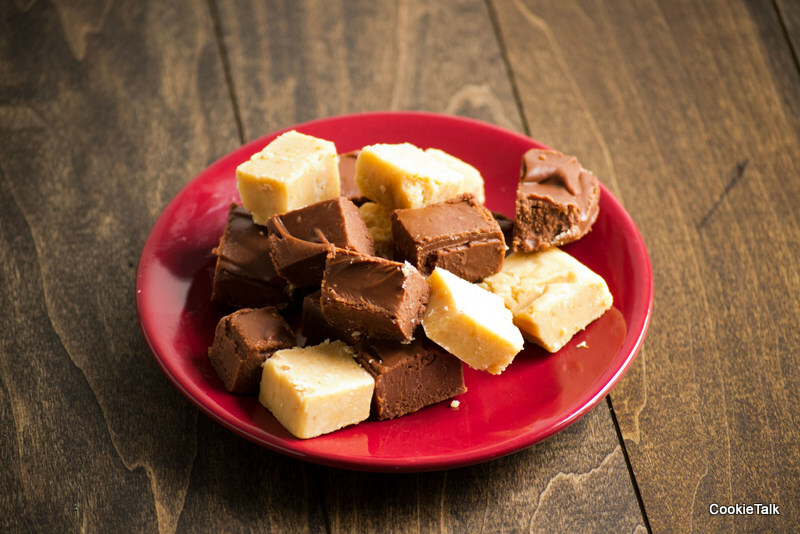 Fudge can be stored at cool room temperature in an airtight container.